Exitguard is the ideal solution for security of fire exit doors. An integral high power sounder is activated when the door is opened to warn those in the vicinity that security has been breached. EX204 is battery powered - Use where a separate supply of power is not available and the protected door is opened infrequently. Depending on usage the 6 x AA batteries supplied can last up to 3 years. 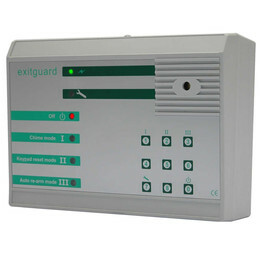 The Exitguard will continue to function for at least two weeks after a battery fault indication. EX205 is 12vdc powered - Use where the protected door may be opened frequently or the integral sounder may need to sound for long periods. There is a logic output signal, volt free relay contacts for separately signalling ON/OFF status/alarm conditions at remote points and can also be used as part of a system. This version cannot be powered from batteries. EX206 is 240vac mains powered - Use where the protected door may be opened frequently or the sounder may need to sound for long periods. There is a logic output signal, a volt free relay contact for alarm condition. This version is also supplied with 6 x AA alkaline batteries for standby. The batteries will not power the alarm relay. Does the unit have volume control? The EX200 Range (keypad) has six selectable tones so this is effectively your volume control. How far can the unit be cited from the door? The unit is supplied as standard with a 1m length of cable into a potted door contact. If you wish to site further than that from the door you could buy door contact DCS/INT and site up to 100m away from the door. If you wished to go further, you could extend using junction boxes.